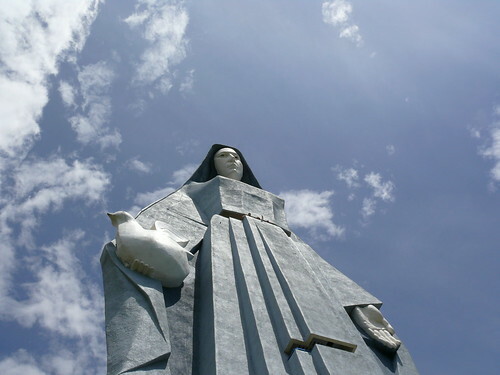 The Peace Sculpture aka Monument to Our Lady of Peace (Monumento a la Virgen de la Paz) is an enormous statue of Virgin Mary about 11 km southwest of the city of Trujillo, in Venezuela. Built entirely of concrete on hollow steel shell, the sculpture is 46.72 meters (153.28 ft.) high, 16 meters (52.5 ft) wide, 18 metres (59 feet) deep at the base and weighs about 1200 tons. The colossal statue is not only the highest statue of the Virgin Mary in the world, it is also the tallest habitable sculpture in Americas being couple of feet taller than the Statue of Liberty (46 m/151 ft) in New York and several feet taller than statue of Christ the Redeemer (38m/125 ft) in Rio de Janeiro in Brazil. The sculpture built in 1983, is located on Peña de la Virgen, a hillock 1,600 meters above sea level, where the Virgin reportedly appeared in the year 1570. It shows the Virgin Mary in blue tunic holding a pigeon in her right hand. The interior of the hollow sculpture is accessible by combination of stairs and mechanical lifts and due to its elevated location and the tallness it offers some amazing panoramic views of the surrounding. First observation point is located at the level of the knee of the Virgin, 18 meters from the base. Second Observation point is located on the left hand of the statue, 22 meters from the base. Third Observation point located on the right hand of the statue is 26 meters from the base. The Fifth and final observation point is located in the eyes of the Virgin at 44 meters from the base and from here most extensive and impressive view of the surrounding areas can be seen. Note: This is not to be confused with my other post World's Tallest Statue of Virgin Mary which I have edited today to read as World's Tallest Statue of Virgin Mary with Infant Christ. Notice the subtle difference, this statue is of Virgin Mary alone, whereas the the other statute in Haskovo, Bulgaria, shows Virgin Mary with infant Christ in her hands. Credits: I am thankful to Daniela Garcia for her comments on my blog post, informing me that this statue is the World's highest statue of Virgin Mary.